Chinese President Xi Jinping and four other heads of state, including South African President Jacob Zuma, on Monday reaffirmed their commitment to build an open economy and ensure free and inclusive trade. Zuma and Xi held bilateral talks on the sidelines of the BRICS Summit in Xiamen. “China and South Africa have maintained close communication and cooperation within the BRICS framework, and China will work closely with South Africa which will hold the presidency of the bloc next year,” Xi said. South Africa will host the 10th BRICS Summit next year. On Monday, Xi said Beijing will work with Pretoria on the ambitious Belt and Road initiative launched by China. 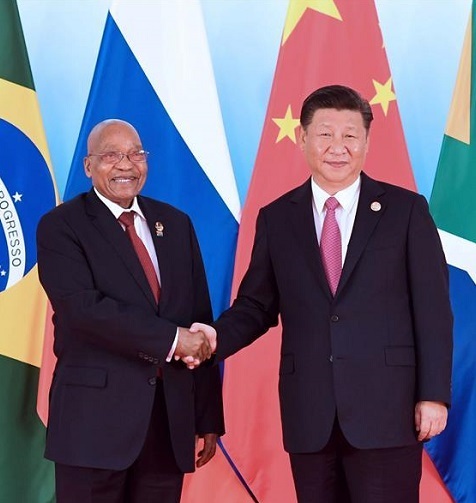 “China intends to work with South Africa to implement the Belt and Road Initiative and the outcomes of the Johannesburg summit of the Forum on China-Africa Cooperation (FOCAC), and to deepen cooperation in an all-round way and advance bilateral relations to a new level,” Xi told Zuma. The inclusive tone of China’s Belt and Road push stands in stark contrast to US President Donald Trump’s “America First” policy. In a steady push for its Belt and Road initiative, Chinese President Xi Jinping pledged $124 billion for the ambitious One Belt One Road program earlier this year. For almost a decade, China has been South Africa’s largest trading partner. South Africa is among the 69 countries, regions, and international organizations that have signed up for the new “Silk Road”, which aims to bolster China’s global leadership ambitions by building infrastructure and trade links between Asia, Africa, Europe and beyond. Zuma is in Xiamen, China to attend the 9th annual BRICS Summit.